Obituary – Enright, Allen Gene « Perry High School Alumni Association, Inc.
﻿Allen G. Enright, 45, Wichita Falls, Texas, formerly of Perry, died shortly after 7 p.m. Tuesday in Veterans hospital, Oklahoma City, following a seven month illness. Arrangements for services were pending Wednesday with a Wichita Falls funeral home. Enright was born April 9, 1928, in Perry. 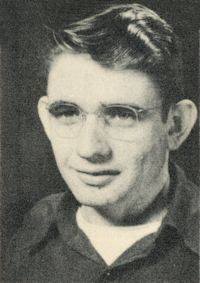 He was a Perry high school graduate and moved to Wichita Falls in 1952. Survivors include his wife and son, Paul, of the home address; three brothers, Kenneth of Shawnee and Larry and Clarence, both of Oklahoma City; and one sister, Mrs. Richard (Mary) Witter; Perry. He was preceded in death by his parents, Mr. and Mrs. Walter Enright.